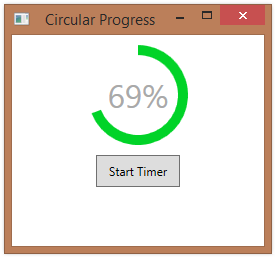 A couple of earlier posts (#1,155 and #1,156) demonstrated how to create a simple custom control that displays progress in a circular fashion. A reader of the blog asked how you would change the color of the progress indicator when it got to a certain value. The example below shows how to do that. Below is the code for the indicator itself. This matches post #1,156 except that we’ve removed the static constructor that overrides the stroke and fill color of the indicator. 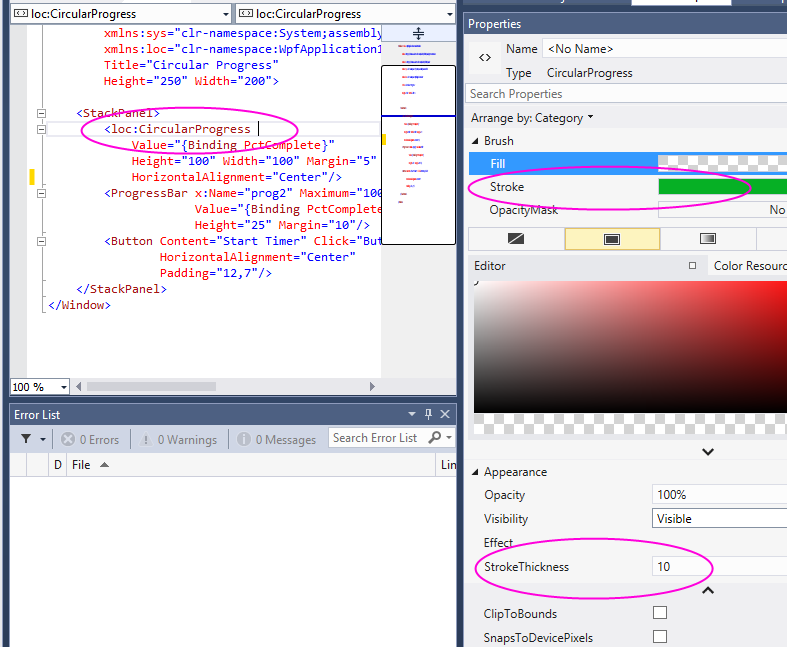 We then have a XAML fragment, where we define an instance of the progress indicator. We also set up a data trigger to set the Stroke and Fill properties to change color when they reach a certain level. When everything is wired up and we run this, we see that the indicator starts out red. And it then turns green when progress gets past 75%. In the previous example, we created a custom circular progress shape and then composed it along with a TextBlock to get a labeled circular progress control. The other approach that we could take is to just create a new control template containing our circular progress shape and a TextBlock and then use that new template as the control template for a standard ProgressBar. 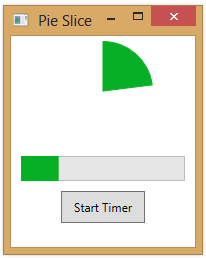 In an earlier post, we created a custom circular progress control, deriving from a Shape element. Below, we add a text element in the middle of the progress arc to indicate % complete. We could have also done this by building the text into the control itself. But the approach shown below is an example of combining the progress control with a user-defined text label. In an earlier example of a custom control, we used the OverrideMetadata method to provide new default values for several dependency properties, as used in our control. For example, we set the Stroke property to a green brush and StrokeThickness to 10.0. These new values will show up as expected in the property pane within Visual Studio. Below, we can see both the green brush for Stroke and the value of 10.0 for StrokeThickness. An earlier post presented a circular progress control that displayed a pie-shaped filled area indicating progress. 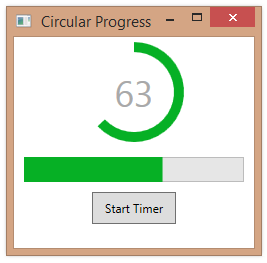 Below is a screenshot showing the updated arc-based circular progress indicator.